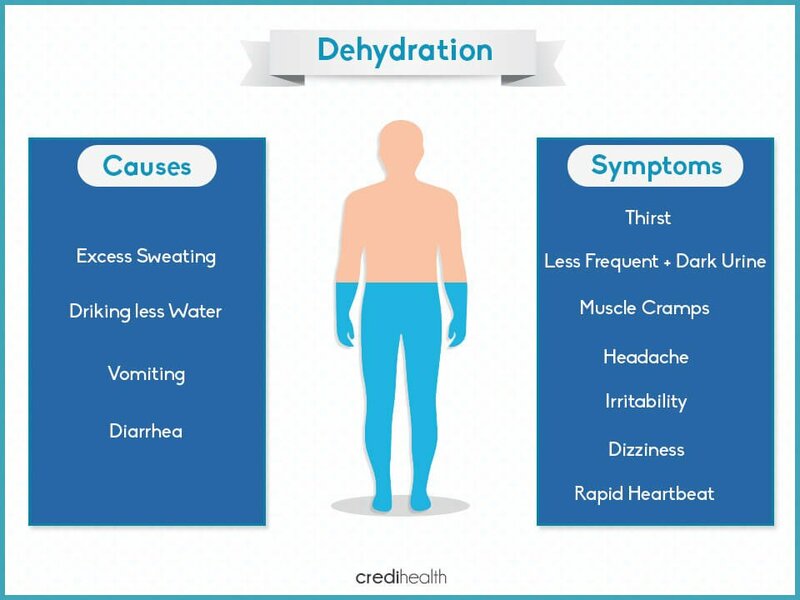 Dehydration involves excessive loss of fluids from the human body in comparison to the intake. Water is indispensable for the human body and about 75% of the body weight consists of water stored inside cells, between cells and within the blood vessels. Fluids are lost constantly from the human body throughout the day through breathing, sweating, and urination. Replacing this lost fluid is important to avoid Dehydration. Diarrhea – This is one of the most common reasons for Dehydration. A considerable amount of water is lost with every bowel movement. Vomiting – The body loses fluid through vomits and it is also difficult to replenish the water as the intake may lead to further vomiting. Sweating – The body loses a significant amount of water and fluids in the form of sweat. The cooling mechanism of the body, hot & humid weather and, excessive physical activity leads to the release of a considerable amount of water. Diabetes – High blood sugar content causes increased urination which in turn leads to an imbalance of the water level of the body. Frequent Urination – Excessive intake of alcohol & medications such as diuretics, antihistamines, antipsychotics, and blood pressure drugs cause frequent urination. Burns – Skin is the protective layer of the body and burnt skin is unable to prevent the fluid from seeping out. A General Physician is the subject matter expert. Replenishing the body with fluids is the only treatment for Dehydration. Drinking water and other fluids like clear broths, ice pops, or sports drinks are helpful. Intake of Oral Rehydration Salts (ORS) also gives instant relief. Some patients may need intravenous fluids to regain hydration. Underlying conditions such as Fever, Diarrhea, or Vomiting which are responsible for Dehydration require medication. It is advisable for the patient to take frequent but small amounts of clear fluids like water, clear broths, ice pops, or sports drinks, such as Gatorade. The amount of fluid required for maintenance of optimal hydration depends on the body weight of the patient. Usually an adult requires 2 to 3 liters of water per day. Patients with persistent Fever, Vomiting, and Diarrhea need immediate medical help. The patient needs to take the medication advised for these underlying conditions. Diet: Clear fluid is the diet recommended for the first 24 hours, following which a balanced diet which includes light and healthy food is best for the patient. The patient needs to avoid milk, caffeinated beverages, fruit juices, gelatin, and sodas. Patients with Diarrhea and Vomiting need to alter their diet as per the advice of the medical practitioner. Activity: Doctors recommend rest to patients suffering from Dehydration. There is no risk of infection of Dehydration to the family of the patient. Increasing consumption of fluids & foods with high water content like fruits & vegetables especially during summers and on days which are excessively hot. Increasing intake of fluids when indulging in excessive physical activities like workouts, jogging and brisk walking. Aged and very small children are at a higher risk of Dehydration. Hence they need special attention. Monitoring the health of the patient is important. The family should encourage the patient to drink water and not miss medication if any. Monitoring frequency of urine output, the presence of saliva in the mouth and tears while crying is important.